Deborah was a judge and prophetess. To this, many of my gender quickly add, “Deborah was also a courageous military leader in battle.” But, what does God’s Word tell us? Q: Deborah was a prophetess. A prophet or prophetess speaks on behalf of another but, as far as I can determine, not as a public speaker for God during a congregational gathering. A prophetess might give counsel, settle disputes, or offer thankfulness and praise to God. Deborah was also a judge. What was the condition of Israel in the years prior to her leadership (Judges 2:13, 16-17; 3:7, 13; 4:1-4)? A: Martin Luther took note of the service of Deborah and other women as rulers. He said that they “have been very good at management.” He suggested that women’s leadership in other areas of life might motivate men to properly fulfill their responsibility. It is important to note that Deborah became a judge after the people of Israel repeatedly “did what was evil in the sight of the Lord.” Evil, in every way, opposes God’s created order for men, women, and the benefit of a thriving society. Q: We may think that Deborah was sent by God into combat against Israel’s enemy. But, is this the case? Q: Deborah served as a judge and prophetess. She counseled Barak as the leader of Israel’s troops. Yet, how did she sum up her role in Judges 5:7? A: Deborah was praised for her leadership, yet she does not sing about being raised up as a warrior. She sings of being a “mother in Israel.” Though no biological children of Deborah are mentioned, she is an encourager and helper for her people. Scripture, like much of human culture, consistently distinguishes the roles of men and women. Q: Specialist Hollie Vallence, quoted in Part 1 of this series, was asked by her country to sacrifice home and family. In doing so, she explained that she had to build an “ice wall around her heart.” Is this consistent with God’s design? What are the consequences for women, men, and children if a mother hardens her heart? A: Luther noted that a woman is merciful by nature because she is born to show mercy and to cherish just as a man is born to protect. This is why, Luther says, no living creature has more mercy than a woman, particularly in respect for her infant. Men are known to focus on one project, putting all others aside, until it is finished. In times of war, this allows them to leave their home and family for periods of time in order to “do their duty.” It is not that they always feel brave and fearless, but perhaps their vocation of steward and protector allows them to do what they need to do for wives, sons and daughters; indeed, for future generations. They are free to accomplish what is necessary, knowing that their children are in the capable and loving care of mothers. Here, then, is the woman partnering with her husband and serving her country by guarding hearth and home while he is doing battle with the enemy of that home. In war, as in work, men understand other men. When a country is serious about winning victory over its enemy, it brings well-trained men together, with no distractions, to focus on the job at hand. These men may return home “changed,” but most can resume life as usual. Mothers, as explained by Hollie Vallence, are not programmed to put distance between themselves and young children. Dr. Vogel offers wisdom: “If God is indifferent to the woman-warrior concept and a woman chooses to serve in a noncombatant role, God is not offended. 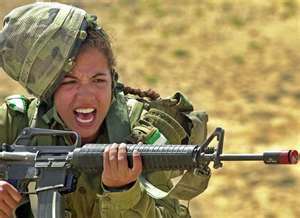 If, however, God is not indifferent to the woman warrior concept, and a woman seeks service as a combatant, does she not become a victim of her own will and disobedient to that of God?” Is there a problem with women in the military? No, but as in any workplace, there will certainly be a changed environment and cautions to heed. A: God was not pleased with the man who used Deborah as a kind of “human shield.” That is because the Groom of the Church does not stand behind his Bride. He stands in front of her. Small tribes and great countries who honor the human rule of chivalry understand that great sacrifice may be necessary in order to protect mothers of children for they are a people’s future. It is not that God wants men to die, but that He entrusts to them the noble role of protector and defender. As the Man of Sacrifice, Jesus led the way into battle. He did not send others. Jesus faced the greatest weapon of mass destruction – the anger of God upon sinful people. He did not stand behind “human shields,” letting you and me die so that He might avoid pain and death. In the battle for the life of His Bride, Jesus “took the bullet.” He died so that we might live. Jesus is both a model and Savior for men and women. He wants us to follow Him and imitate His behavior. Sinful as we are, we will want to test the boundaries. We will put ourselves in God’s place, but such pride can put others at risk. Is all hopeless? No! The One who faced our enemy – and won the eternal victory – reaches to us with nail-pierced hands, saying: “The thief comes only to steal and kill and destroy. I came that you may have life and have it abundantly” (John 10:10). I am the Way, the Truth, and the Life” (14:6). Men, Women, and Relationships, first published in 1999 and revised in 2004.